With more and more people working overtime and work responsibilities often including extensive travel, sometimes it can feel a bit overwhelming. 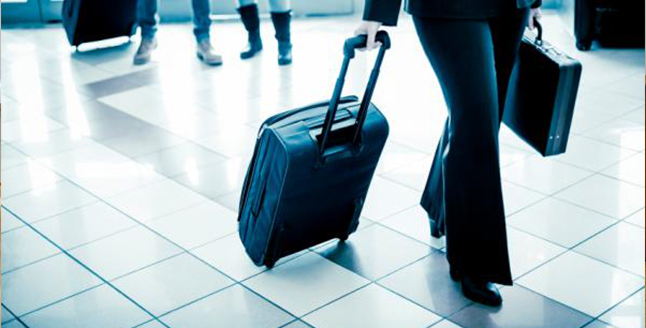 Here are five useful tips to make traveling efficient for busy professionals! Use apps to make travel stress-free, whether it be to book hotels and air tickets, or to keep tabs of all your reservations and itineraries. It is much easier to access everything on-the-go from one mobile device, rather than sifting through multiple sources. Needless to say, regardless of whether you book through an app or not, avoid layovers and connecting flights to ensure no time is wasted through delays while commuting. Yes, we had to pull the “My Precious” reference, but, it is true – carrying luggage on-board helps minimize risk of it getting lost and also a long wait time at the baggage carousel. However, IF you must check-in your luggage, label it as “fragile,” so people take extra precaution in handling it, and also because it is more likely your luggage will be returned quickly. If you are out for a business trip, try to extend your stay by a few days to explore local surroundings – this is a cost-effective way to travel, so go ahead and morph your business trip into a vacation at the end. Also, keep a list of friends and potential work contacts to network with during your stay – combine work and leisure. Setup an out-of-office assistant when required while traveling, so all professional contacts know whom to get in touch with when you are unavailable. Select hotels where there is free WiFi, so you can complete work efficiently. Expect delays, so multitask by finishing pending work while en-route, or read that book you always wanted to but had no time for, or pay those pending bills when you have time to kill. After landing, if you do not have a pick-up arranged prior to arrival, go ahead and book an Uber (or, it’s local equivalent) while exiting the airport, so it arrives by the time you are out of the airport. An unhealthy professional is seldom a productive professional. Make sure you get enough rest before flying out so you can stay on top of your work game once you land. Keep a first-aid kit and important medication handy. Try to carry a meal and healthy snacks, to avoid consuming junk food and falling ill. Also, stay hydrated as much as you can. Next Next post: Uncover India Through Road Trips – 4 Reasons Why! Uncover India Through Road Trips – 4 Reasons Why! 5 Facts About Maharashtra That Will Get You Packing Your Bags NOW!